Monday is the 40th anniversary of the Cuyahoga River fire of 1969, when oil-soaked debris floating on the river’s surface was ignited, most likely by sparks from a passing train. The fire was extinguished in 30 minutes and caused just $50,000 in damage. But it became a galvanizing symbol for the environmental movement, one of a handful of disasters that led to the creation of the Environmental Protection Agency and to the passage of the Clean Water Act. 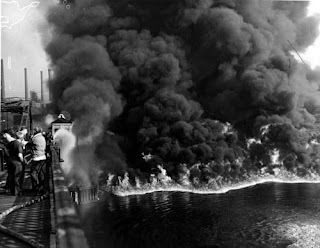 The 1969 fire was tiny compared with those that engulfed the Cuyahoga and other rivers that received large amounts of industrial pollutants from the 1800s through the 1950s. One reason it received national attention, including a prominent article in Time magazine, was that the problem of rivers catching fire was mostly solved by then, said Jonathan Adler, an environmental law professor at Case Western Reserve University. Today, the Cuyahoga is home to more than 60 species of fish, said Jim White, executive director of the Cuyahoga River Community Planning Organization, a nonprofit group that coordinates cleanup efforts. Beavers, blue herons and bald eagles nest along the river’s banks. Long sections of the Cuyahoga are clean enough that they no longer require aggressive monitoring, regulators said. Cleveland and nearby Akron were conservative industrial cities at the time. The clean up of the Cuyahoga River didn't come about because civic leaders in northeast Ohio tossed aside their grey flannel suits for jeans and love beads. The Cuyahoga River was cleaned up because it had become a civic embarrassment. What's the use of having Major League Baseball and NFL franchises when comedians are making jokes about your city? Wanting Chrysler and GM to Fail?